NEVER TOO LATE TO SIGN UP! WE NEED YOU! Ok folks! We have the map, the colors and the FUN ready to go! All we need is YOU! 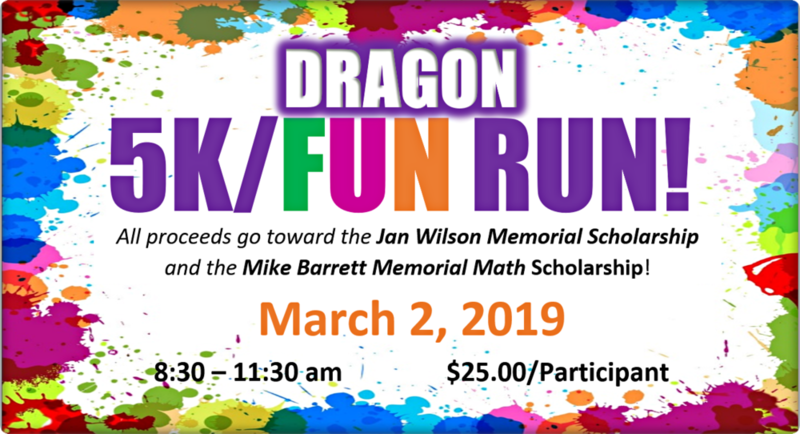 Join us in the morning (Saturday) at 8:30am for our Dragon 5K/Fun Run!! Your $25 registration fee will go toward memorial scholarships to deserving seniors! YOU DON'T WANT TO MISS THIS SPECIAL EVENT! 101.5 The Hog will be on remote with us during the Fun Run! Let's honor the wonderful memories of Coach B and Mrs. Wilson as we do this for them! PLEASE COME JOIN US! ~ Ages 5 and up are welcome to participate! ~ All participants, regardless of age, must submit entry form and pay participant fee! ~ Ages 10-under will receive a medal as well as a t-shirt!